Customs Seize seven-point-three billion naira Worth Of Tramadol, Two Aircraft – Royal Times of Nigeria. 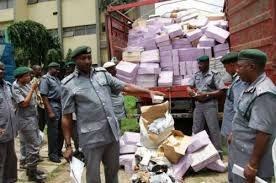 The Nigerian Customs Service (NCS) has seized forty-foot containers laden with Tramadol and other dangerous drugs valued at seven-point-three billion naira imported from India through the Lagos Port Complex, Apapa. The seizure came less than a week after twenty-three containers laden with five hundred and eighty-one million tablets of Tramadol were intercepted at the same port by the National Drugs Law Enforcement Agency. Also, the service seized two helicopters imported from the United States without end-user certificate and other documents. 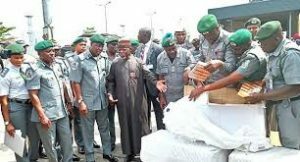 Comptroller General of Customs, retired Colonel Hameed Ali, explained in Lagos yesterday that three suspects, including a Customs officer who cleared the containers, had been arrested for further investigation. He added that the smugglers offered NSC officials one hundred and fifty million naira to ensure that one of the containers was release to them. The Customs CG said that it was worrisome to note that there were Nigerians who were ready to make money at the expense of human lives by bringing in such quantity of drugs that had grave consequences on health and national security.